Book Launch for Marcia Falk's "Inner East: Illuminated Poems and Blessings"
Poet and painter Marcia Falk will present her new book, Inner East: Illuminated Poems and Blessings, which pairs her poetic writing with her intensely colored original paintings to create a meditative dialogue. In addition to reading her poems and blessings, Marcia will show slides of the artwork in the book. Through the use of words and images, Falk re-visions the mizrach—the wall hanging that points eastward, the direction Jews traditionally face in prayer. The poems, paintings, and blessings in Marcia Falk’s collection point toward an “inner east”—a focus for the prayer of the heart. 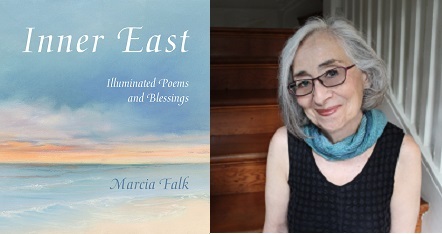 Marcia Falk is a poet, painter, translator, and Jewish scholar, widely known in the Jewish world for The Book of Blessings and The Days Between, her re-creations of prayer from a non-patriarchal perspective. Her book The Song of Songs: A New Translation and Interpretation was praised by I.B. Singer as “better than the King James.” Falk is also known for her translations of the work of modern Yiddish and Hebrew poets. Marcia Falk’s books will be available for purchase at a special discount and a light reception will follow the program.